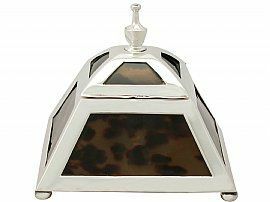 This exceptional antique Edwardian sterling silver and tortoiseshell inkwell has a plain trapezoidal prism shaped form. Each surface of this impressive inkwell is embellished with an exceptional tortoiseshell panel with paralleling broad sterling silver borders. This antique inkwell is fitted with a domed panelled cover surmounted with a sterling silver elongated urn style finial, securing with a screw fitment to the interior. The anterior surface of the cover is fitted with a hallmarks incurved shaped thumbpiece. The cover opens to reveal the removable copper and glass ink liner which is ornamented with a cut glass star motif to the underside. 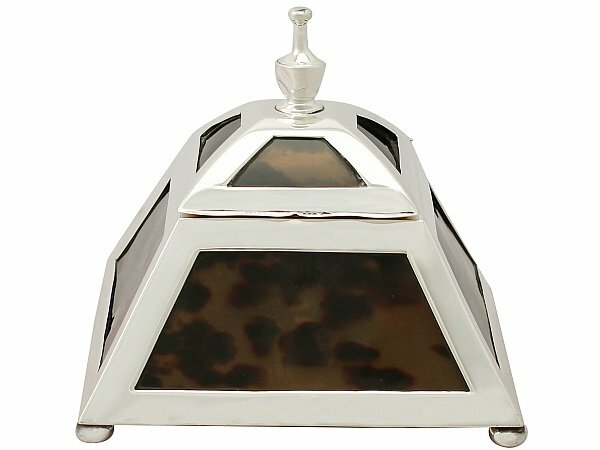 This antique tortoiseshell inkwell has a weighted sterling silver base and is supported by four bun style feet. This antique inkwell is a very good gauge of silver, exceptional quality and in exceptional condition, in keeping with age. The tortoiseshell panels are in perfect condition. Full hallmarks struck to the underside of the body and part hallmarks to the thumbpiece are all very clear. Not measurable due to the weighted base and tortoiseshell.